[By Nick] Writing for On Second Scoop does have its perks. One of those being that I’m able to try brands I never would’ve had the opportunity otherwise. G.S. Gelato is one of those companies. Out of Fort Walton Beach, Florida, G.S. was only on my radar because I saw a couple of their products on Ice Cream Source awhile back. G.S. is actually a newcomer on the frozen dessert scene when they opened up shop in early 1996. It was started by a couple who moved to Florida from Italy and was determined to bring authentic Italian gelato to America. G.S. offers their products in all different forms. From offering retail products to being able to open up your own Gelataria, they are there for whatever you need. After some pleasant emails with the fine folks at G.S. Gelato, they sent over two free pints of their gelato as well as two free pints of their sorbetto. 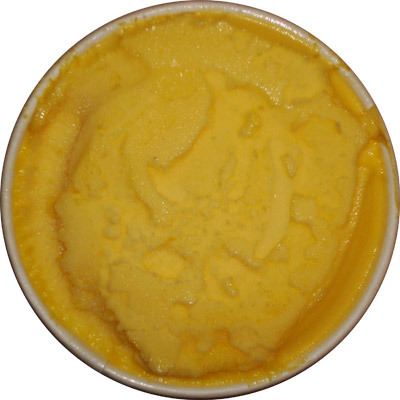 Seeing as we don’t cover sorbetto all that often, I decided we’ll start there with their Mango Sorbetto. A quick refresher course in sorbetto: first of all from my extensive research sorbetto = sorbet. I’m going to keep typing sorbetto though because it makes me feel fancy. 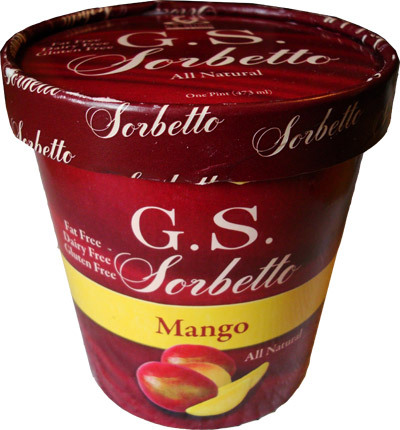 In a nutshell though, sorbetto is just a frozen dessert made from sweetened water flavored with fruit. 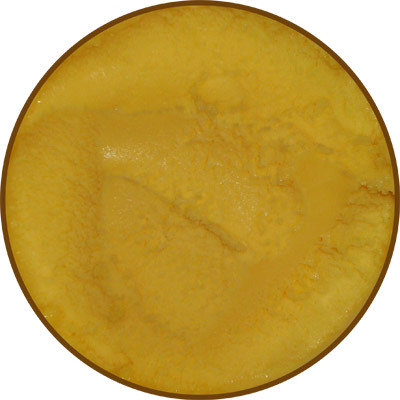 Unlike ice cream which uses dairy products and has air whipped into it, sorbetto has neither of those two elements. Okay, that’s your crash course in sorbetto, if you want to learn more go ask google or something. Now if using the word sorbetto makes me feel fancy, the container only adds to the fancy factor. It just looks elegant with its wavy ruby red coloring. They add in a yellow stripe that works perfectly with the color of the sliced mangos on the package. Props on use of color contrasting G.S., other companies need to make their products more eye-catching. Removing the lid, this is the creamiest looking sorbetto I have ever seen. The color is also spot on resembling the color of a mango. Just like gelato, sorbetto has to be tempered as well. After waiting the recommended 10 minutes, I decided it was about time to dig in. Looks definitely aren’t deceiving with this one either because this sorbetto is very creamy. If the container didn’t state that there is no dairy in here, I would think this was a premium frozen yogurt or even a very refreshing ice cream. Sure there was an icy part or two but the rest was remarkably creamy. Just like the color, the flavor is spot on as well. Describing the taste of a mango is difficult; the only words that come to mind are tropical and refreshing. I’ll just be blunt and say that this stuff is delicious and officially my favorite sorbetto that I have ever had. From the remarkable texture to the perfect taste, this one is an all-around winner. Even if you only like mangos a little bit, you need to give this stuff a try. On Second Scoop: I still can’t get over how creamy this stuff is. Looking over the short ingredient list, there’s not really anything popping up on my radar. There’s guar gum but that’s normally there to stop the formation of ice crystals. It’s also used as a thickener but I don’t think that would be enough to make this one as creamy as it is. I’ll chalk this one up to black magic and just continue enjoying this sorbetto. I'm shocked (in a good way) at how much like ice cream this sorbetto looks. I actually wish I could try it now. Their Blood Orange is amazing. My mouth is watering just thinking about it. It was mind boggling how similar to ice cream this actually was. It defies all logic in my mind. How many calories are in that pint? Great review! Thank you very much! There's 128 calories per serving, so it would be 512 for the whole pint.